Cairo central station. January, 2018. Photo Credit: Egyptian Streets. 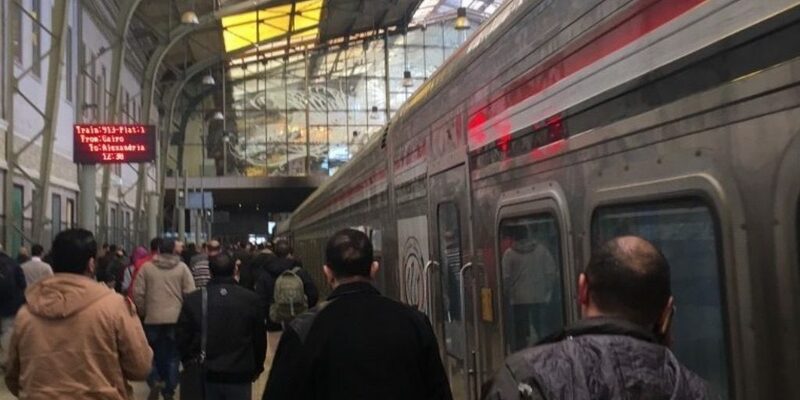 Egypt’s Transport Minister Hisham Arafat has announced that prices on railway tickets will increase with 20 to 25 percent on a number of lines, while prices on tickets of suburban railway lines are expected to see even larger price hikes in the coming period. As has been the case with Cairo’s metro system, the Egyptian government argues that ticket prices need to be increased in order for the state to be able to upgrade the rail network and to keep up with the costs of regular maintenance. “The pricing system is very poor,” Arafat said, referring to Egypt’s railway. “We will see a different railway system starting mid next year […] a qualitative improvement will be felt by March/April 2019,” he continued to remark. With this in mind, Egyptian Streets decided to review the current performance of Egypt’s railway and assess whether improvements are needed by taking several trips on one of the most frequently-traveled routes, namely, between Cairo and Alexandria. Although we’ve heard about the possibility of online booking, that option could not be found on the Egyptian Railways website, and there was no answer when trying to call the customer support telephone line. So to book the tickets, we had to go to the ticket window at a railway station. While prices vary according to how close to the departure date one purchases the tickets, a first-class-ticket goes for approximately EGP 100, while a second-class ticket for around EGP 50. On routes other than the Cairo-Alexandria line, there are trains without class-divisions but that would be considered third class due to its very low standard. At both railway stations in Cairo and Alexandria, there are large screens updating the train schedule with the platform number, departure time and train number (in Arabic and English), making it easy to find your way to the right train. After the train arrives at the platform, it is also easy to find your cart, as each one is clearly numbered. 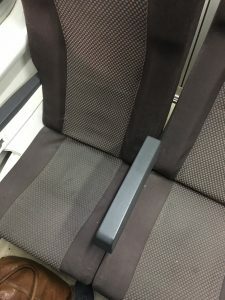 While the seats in the first and second class carts have individual numbers, “third class” carts have neither cart nor seating numbering. On one of Egyptian Streets’ journeys, the Cairo-Alexandria train left about 20 minutes late and arrived 35 minutes behind its scheduled arrival time. This happened repeatedly. Delays in Egypt’s railway system are quite common, especially train lines connecting Cairo to cities in Upper Egypt. 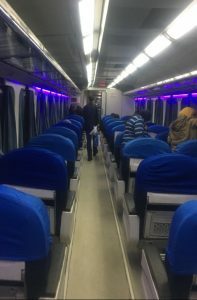 Second-class cabin on Cairo-Alexandria train. Photo Credit: Egyptian Streets. While there are arguably only slight differences in terms of standard between first and second class carts, the gap is very wide between Cairo-Alexandria trains and some of the other “third-class” trains, which often connect Cairo to Upper Egypt. First-class seats Cairo-Alexandria train. Photo Credit: Egyptian Streets. In first class, the seats are quite roomy, a manned cart with refreshments and light meals regularly passes through the train, it is possible to order a hot meal, and the AC works very well. However, for a first class cart, you’d expect more. The seats in some trains seem very old, some have visible stains on them and there are no electrical outlets to charge your phone with. 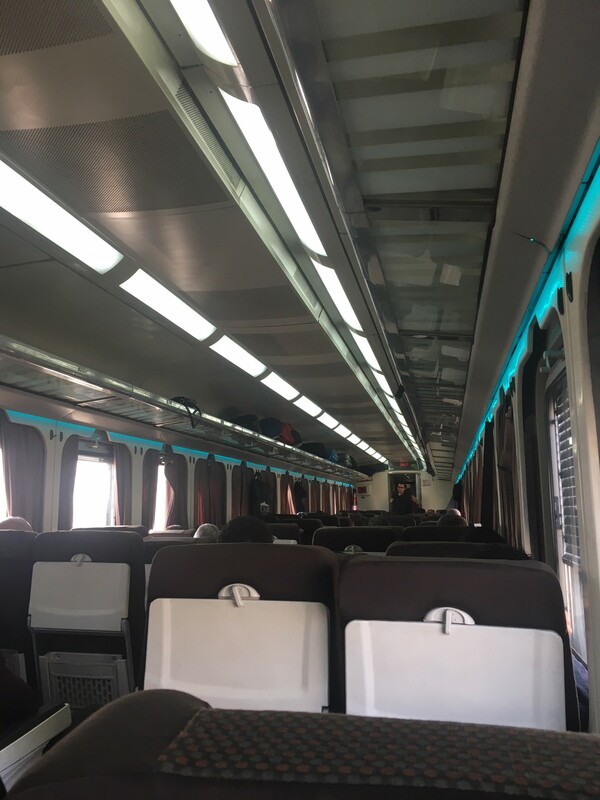 Second class seat on Cairo-Alexandria train. Photo Credit: Egyptian Streets. The seats in second class are not significantly different from first class, except perhaps being slightly less spacious and a different color. Second class also has AC and a manned cart where you can purchase refreshments and light meals. First-class cabin on Cairo-Alexandria train. Photo Credit: Egyptian Streets. However, it is not possible to order hot meals here. In addition, the standard of both first and second-class carts can arbitrarily differ from one train to another. Some are arguably very nice, while other ones are not. You never know which ones you end up riding before actually boarding them. 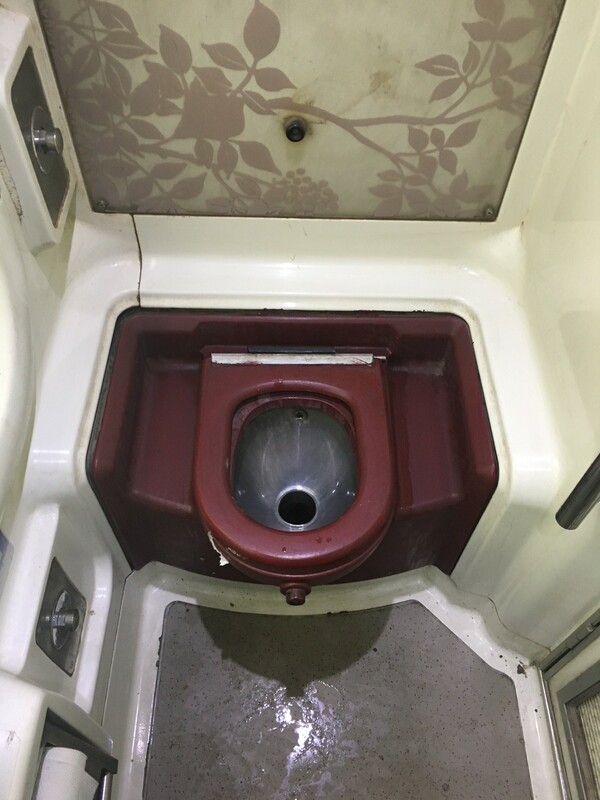 There are no visible differences between the quality of toilets in first and second class. Sometimes they are quite clean while other times they certainly are not. However, there is never any soap available to wash your hands with. Toilet on Cairo-Alexandria train. 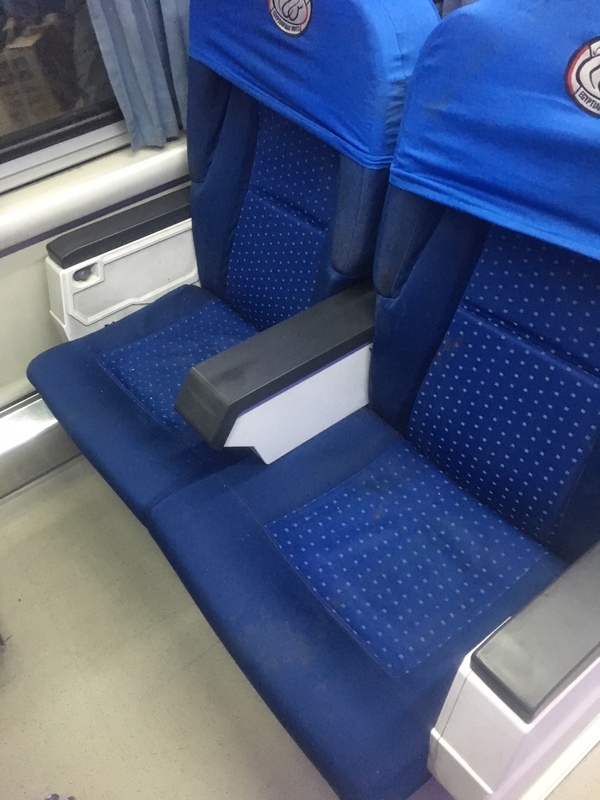 Second class seat on Cairo-Alexandria train. Photo Credit: Egyptian Streets. Meanwhile, the “third class” trains are where the big difference is. The carts are extremely run-down, dirty and old. There are no individual seats, and hence no seating numbers. People sit on benches, stand or sit on the floor if it is crowded. There are neither AC nor refreshments or meals to be purchased. On top of that, the carts often lack both doors and lighting. 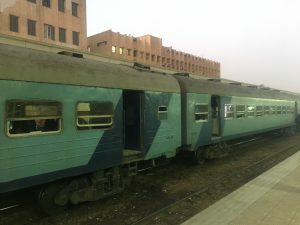 A lower-standard train at Cairo central station. Photo Credit: Egyptian Streets. It is clear that Egypt’s trains need to be upgraded in order for citizens to be able to enjoy a respectable and well-serviced travel experience. First of all, third-class trains should probably be taken out of service completely and be replaced with newer ones that ensure a basic travel standard for everyone, regardless of the ticket price. Also, if one purchases a first-class ticket, one would expect a lot more than what is currently on offer. The seats need to be thoroughly cleaned, or preferably replaced altogether, and electronic outlets should be installed. A basic thing such as soap in the bathroom could also very easily be fixed. When it comes to ticket pricing, the Transport Ministry should take people’s financial capability into consideration. Those traveling in first class would most likely be able to handle as much as a 50 percent price hike on their tickets. However, second and “third class” travelers, who mostly consist of Egypt’s middle- or lower classes, have been increasingly squeezed financially since the devaluation of the pound currency in late 2016. As such, they do not need yet another strain on their wallets and deserve to be excempted from the planned price increases. Egypt’s railway network has huge potential and should be fully exploited. Egypt should do so not only as a means to limit private car travels as a means to decrease traffic congestion, but also to reduce the country’s carbon imprint and, in the long term, improve the quality of life for its constantly growing population.